A dynastic union is a kind of federation with only two different states that are governed by the same dynasty, while their boundaries, their laws and their interests remain distinct. It differs from a personal union in that a personal union is under a monarch, but not under a dynasty, although it depends on the country. With the assassination of Sancho IV, Navarre was invaded by his cousins Alfonso VI of Castile and Sancho V Ramirez of Aragon, and the latter made king in 1076, leading to more than half-a-century (1076–1134) of Aragonese control. Dynastic union between Spain (the union between the Crowns of Castile and Aragon) and Portugal (1580–1640),  generally called the Iberian Union by modern historians, under the Philippine Dynasty. 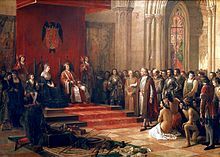 Marriage of Jogaila and Queen Jadwiga of Poland on 1385, generally called the Union of Krewo. That union laid the foundations for the eventual formation of the Polish–Lithuanian Commonwealth. Following Salic law, Henry III, King of Navarre, a member of the House of Bourbon, succeeded to the French throne in 1589 upon the extinction of the male line of the House of Valois. Both houses were cadet branches of the Capetian dynasty, the ruling house of the kingdom of France since 987. When Elizabeth I of England died in 1603, the heir to the English Throne was King James VI of Scotland. Generally called the Union of the Crowns, this dynastic union was in place from 1603 until 1653 (when the monarchy was officially abolished) and again from 1659 until the two nations were united in 1707. ^ Lalor, ed. Various authors. See Contents. Cyclopaedia of Political Science. New York: Maynard, Merrill, and Co., ed. John Joseph Lalor, 1899. ^ John C. Shideler. "A Medieval Catalan Noble Family: the Montcadas, 1000–1230". Retrieved 24 April 2008. ^ Cateura Benàsser, Pau. "Els impostos indirectes en el regne de Mallorca" (PDF). Retrieved 24 April 2008. El Tall dels Temps, 14. (Palma de) Mallorca: El Tall, 1996. ISBN 84-96019-28-4. 127pp. ^ H. J. Chaytor. "Juan II. Union of Aragon with Castile". A History of Aragon and Catalonia. Retrieved 17 April 2008. ^ Stanley G. Payne. "Chapter Ten, The Expansion". A History of Spain and Portugal, Volume 1. Retrieved 24 April 2008.